airport. Conveniently located on a property of 2.700.000 m2 it is the only 5 Star with an 18 hole golf corse on the island. A total of 312 spacious de luxe rooms, including 17 suites, all equipped with satellite color TV with remote control and radio, mini bar, air conditioning, safety deposit box, direct telephone, and hairdryer in bathroom.  European Spa with medical service, massage, dieticians, jaccuzzi, aerobics and body-shaping machines, beauty parlour and hairdresser.  Day and Night Entertainment.  Two swimming pools and water mirror.  Direct access to the beach.  Bohío Bar by swimming pool area.  The White Peacok Piano Bar.  18 hole golf course designed by an international expert, with starting time guaranteed, practice driving range, pro-shop and bar.  2 lighted tennis courts. Water sports: windsurfing, diving, sailing, jet ski, and water ski.  Surrounded by everglades and natural areas. Located in Playa El Agua, the most popular beach in Margarita Island, 35 Km from the arirport and 25 minutes from Porlmar, the comercial cneter for Duty-Free shopping, restaurants and night life. The Hotel Hesperia Playa El Agua represent an excellent alternative to enjoy your vacations with family and friends in a relaxed ambiance with the concept all inclusive. The hotel is perfectly located on Los Uveros beach facing the Caribbean, only a fiveminute drive from the bustling duty free port of Porlamar, and 20 minute drive from International Airport.  336 luxurious guest rooms, each with private balcony, individual climate control, remote control TV with satellite reception, direct-dial telephone, alarm clock-radio, mini-bar and sun-bar.  Le Chateaubriand: Offers fine french cuisine.  Los Uveros Restaurant: provides a comfortable, elegant atmosphere and pool views.  Las Marinas: is and outdoor restaurant beside the sea and pool, convenient for sunbathers at lunchtime. 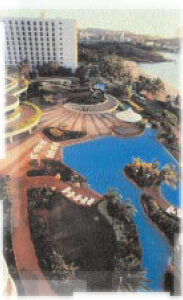  Take your choice of two bars including the lobby bar with its picture windows, framing panoramic sea views.  Swimming pool, two night-lit tennis courts, gym, sauna and massage.  Beach with wide array of beach sports such as water-skiing,sunfish sailing and snorkeling.  Same day laundry/valet service (Monday-Friday).  Concierge and multilingual staff. On the Island Margarita, just steps Hawai from the cristal clear waters of the Caribbean, there is a Health Spa and Hydro quite unique in all the Americas: the only such centre with and exclusive license from the celebrated Parisian cosmetic house Thalgo. Through personalised programes of hydro therapy and beauty treatment, the equilibrium of mind and body is restored, by combining the beneficial effects of salt water, pure air and natural products from the sea. 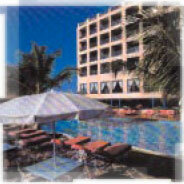 La Samanna de Margarita is provided with a heated sea water swimming pool, using ultra modern equipment. Staff are specialist trained in France. La Sammanna Resort has been conceived as a complement to the Sea Spa and Hydro. A luxurious resort designed to the highest European standards.  56 rooms on tour floors each with balcony and two queen size beds or one king, with mosquito nets and ceiling fan, satellite and cable TV, fax machine, mini-bar and safe, central air-conditioning, fully equipped bathrooms with fresh and sea water bath tub and shower, bidet, telephone. 8 ground floors suites, with private garden and a jacuzzi. PH Suite with 2 rooms. The Paradise Suite  a 200 square metre, three rooms, penthouse with its own external kitchen, private 200 square metre terrace and swimming pool.  The Sirenuse and Positano Rooms  multi purpose first floor (US second floor) rooms with a combined area of 450 square metres.  24 hours rooms service.  Drugstore, La Samanna sports wear boutique. Thalgo beauty and cosmetic boutique. A shopping centre of shops offering a range of goods including handicrafts, travel agency, hair dressing salons and barbers shops, ice cram, rentals, etc. 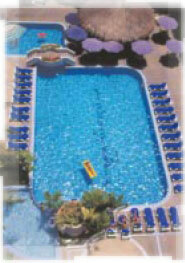  A sea water swimming pool at a constant 37ºC for aquatic aerobics and exercise.  A sea water jacuzzi (spa).  Spa therapy in 192 jet massage baths.  Sea water micro-bubble hydro-shower.  Micro algae body wrapping.  The exclusive Thalgoptima body treatment by Thalgo.  Hydro and aroma therapy.  Hand and feet care.  Solarium.  Massage sauna. Across from the beach and the Hilton Casino, close to the golf course, marina, amusement park, and the historic town of Pampatar. In close proximity to the best shopping centres, restaurants, day and night time entertainment spots.  Located in Costa Azul the most exclusive area of Porlamar on beautiful Margarita Island.  All apartments have a wonderful sea view or overloock the swimming pool/garden area, include kichenette and are designed for your maximum confort. 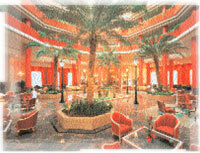  International restaurants, snacks bar, meeting and events facilities, business center, fax and internet access.  Pool kids club, tropical churuata bar, travel agency, shops, rent-a-car, padi scuba, activities, laundry facilities. The Hotel Pueblo Caribe, Caribbean style construccion, is situated on the beach, surrounded by gardens and landscapes and only 20 min from downtown.  Animation for children and adults. The Flamenco Hotel Villas & Beach Club is located on the Northeast coast of Margarita Island and right on the famous "Playa El Agua" offering all amenities available at a beachfront properly.  Pacos & Pepes Restaurant: Breakfast, lunch and buffet dinners.  El Gazebo Restaurant: Romantic "a la carte" dinners.  Alligator: Drinks and snacks at the pool area.  Margaritas Lobby Bar: Exotic tropical cocktails.  La Palapa Beach Club Bar: Refreshing drinks by the beach.  El Tablao: Mini Shows, games and entertainment hosted by the flamenco Fun Staff.  Mini Club:Children activities center.  Charlies Gym Club: Weights and workout equipment to keep in shape. Confortables rooms, three floors buildings, Mediterranean Caribbean type construction, gardens surrounded, located at the most tropical beach of the Island, Playa El Agua, our property is located in front of the beach and we count with our own Beach Club.  Three swimming pools for Adults and Childs.  Daily Activities programs for Adults and Childs.  Night training with our animation staff.  Games room: Pool, Dominoes, Chess, etc.  Parasol and chaise longue service at beach and swimming pool area.  All meals (Breakfast, Lunch and Dinner) All Included Plan.  Parking Lot and private vigilance.  La Fragata (Breakfast, Lunch and Dinner buffet).  Mama Mía (Pasta specialized).